Sunday morning, Austin’s Capital Metro transit agency relaunched its core service, with a reconfiguration of its bus service into a frequent grid network. More than a year ago, we explored how the changes would provide more low income people with access to frequent transit. Zenobia Joseph, an activist and longtime critic of the upcoming changes, warned the board that Cap ReMap does not comply with Title VI of the Civil Rights Act of 1964, which prohibits racial discrimination in programs that receive federal funding. Joseph alleged that some low-ridership routes in whiter parts of town will receive improvements while low-ridership routes on the east side are being cut or dramatically diminished. Following our research trying to actually see how many people would benefit, Capital Metro staff replicated the work with their own data and analysis, yielding similar results. 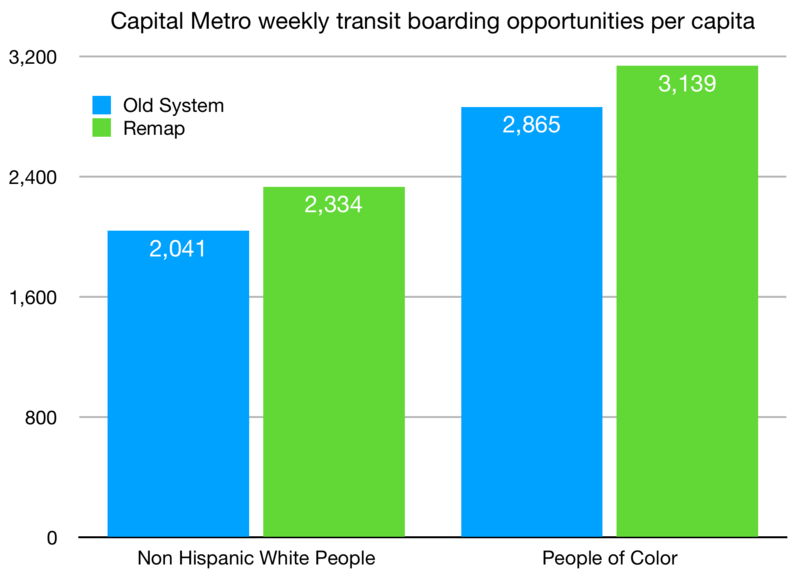 They found that more People of Color and more low income people would have access to frequent transit with Cap ReMap compared to the old system. This section of the Board Meeting packet from the November 15, 2017 meeting shows the staff analysis based on our approach. The full meeting packet includes the Title VI Service Equity Analysis that Cap Metro conducted to assess whether there were innapropriate disproportionate impacts of the service changes. Our report over a year ago called for further research to look at the impact of service changes on all people, not just the limited look from our report at how many people would have access to frequent transit. The frequent grid network revolution begun in Houston is theoretically intended to provide more people with better transit, including low income people and historically marginalized groups. Yet, data should support these claims, before and after the changes. Recently, we have developed one way to respond to the question of how different groups theoretically benefit from Cap ReMap. We used the GTFS data on the previous Capital Metro system as well as the GTFS data for the new system in Cap ReMap to understand access to transit across the Austin region. First we determined the amount of boarding opportunities in each census tract – how many opportunities every week there are to get on a bus or train in that tract. Next we normalized this by square mile. Census tracts are heterogenous shapes – wildly different sizes – meaning that in a larger tract, a person on one side of the tract would have a long walk to get on a bus on the other side of the tract. This also compensates for the concern of those that object to the long stretches between stops on CapMetro’s MetroRapid, such as Mr. Dahmus. Finally, we multiplied opportunities to board transit per square mile times the total number of people living in the tract, People of Color living in the tract, and Non-Hispanic White people living the tract. According to our assessment of how many doors open for the people of Austin to ride transit, the old system provided more access to People of Color and the changes seem to provide increases in access to Non-Hispanic White people at about the same amount of increase as for People of Color. However, the concept of reconfiguring a whole transit system to focus on providing more people with more access seems to mean removing illogical services with high costs per rider. While it makes sense to reallocate service away from places where it costs the transit agency high prices like $40 a ride, real people and whole neighborhoods lose service in this situation. We believe that improving transit service across Texas requires transit agencies and local governments to do a much better job of providing services – based on data – to as many people as possible, while ensuring that all changes have equity assessments integrated throughout. However, we also believe that Texas cities continue to suffer from a severe lack of transit funding. We must increase the size of the transit pie, so that transit-dependent and transit-supportive communities are not fighting so much over insufficient pieces of the pie. This is why we launched One Thousand Texans for Transit. We hope you will join us at one of the events planned in Austin, San Antonio, Houston, Dallas, and Taylor this month.